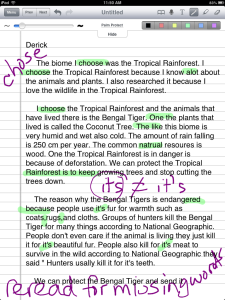 My students publish a variety of work on their iPads and use different apps throughout the writing process. When it comes to typing up their final product we often use PaperPort Notes. Before they send their work to print, I use the highlighter and marker tool to show them where edits and revisions need to be made. I write over their work, and send them back to their seats to make changes. The best part is that I can erase my notes once edits are made without losing any of the text on their page! Are you in the middle of the writing process? Check out my common core aligned lesson plan using Grafio Lite. Here’s another common core aligned lesson plan using graphic organizers in the classroom! *great for peer editing too!